The bottom 2 teams from each league will be demoted to the "A" League next season, to be replaced with the top two teams from the "A" League. Photos to the right: The Luneng Team of Liu Guozheng, Ma Lin, Zhang Yong and Guo Keli. Note: Qiu Yike (3-17) and Tang Peng (12-10) did well at the recent ITTF Pro-Tours. Photos to the right: The Hebei team of Wang Tingting, Niu Jianfeng and Bai Yang. *Takeda is defender Matsushita's wife. They married right after the Osaka Worlds. Note: The above results do not include Golden Ball Match results. Comments were made by the winners' coaches. Jiao (born April 8, 1983) is a right handed fast attack shakehand looper. On 6/19, Jiao upset Wang Nan (-7, 9, -8, 3, 9). 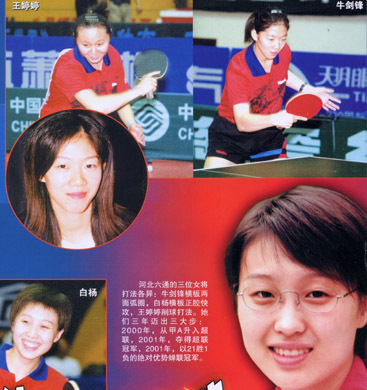 Her best record was team champion at the 2001 Universiade. Her coach's comments: "Jiao had no mental burden, and she played to her full ability. Technically she received serves well, and also won quite a few long rallies against Wang. The quality of her loops, her placements, and her control were all slightly better than Wang's. On the court, she appeared to be at the same level as Wang, and perhaps Wang was a little too tight." An Konishi beat Wang on June 19 in the Golden Ball match 5-4. Coach's comments: "Even though last time (Phase 1) Konishi beat Wang 5-2 in a Golden Ball match, she did not want to play this match, and she tried to use her sore legs, sore wrist as excuses. She did not do well in the earlier singles match, losing 1-3 to Li Jia. In doubles she and Yu also lost to Wang/Li. Perhaps she did not want to lose 3 points in this tie. But I decided to play her. I believe that a player should get up right away after falling down. Once on the court, she did not appear to be affected by the previous matches, and she played relaxed. The score was close all the way, and she fell behind 3-4. But finally she won based on her rallying skills. Liu beat Kong on June 22 3-1 (12, -7, 6, 9). Liu (born in 1982) is a right-handed looper with a fast attack style. He was 5th in the Nationals MS in 2000, and 2nd in MD at the 9th National Games. Coach's comments: "The two players were playing very aggressively. Overall Liu played up to his ability, although not superbly. Perhaps Kong had not been training properly; he made too many unforced errors. In the national team, Liu had almost never beaten Kong, so we were very surprised. The key is Liu's mental state. He was playing without any baggage, knowing that it was OK if he lost. Kong was not as relaxed, and he was rushing a bit." Zhu beat Liu 3-0 (9, 9, 8) on June 29 in the Nanjing-Shaanxi tie. Coach's comments: "Zhu beat Liu in phase 1, and the key was that his long placements controlled Liu. This time Zhu made some minor technical adjustments. Liu has many different serve receive skills, so Zhu primarily served top-spin to Liu's extreme backhand. Liu could only block those serves, and could not step around to attack them. After service, Zhu would play rallies with Liu, and that is Zhu's specialty. especially with his powerful backhand. Another key is that it was very humid, and Liu was concerned about his pips surface. He was less decisive in his attacks, because the ball sometimes would skid off. Ju played even more relaxed than last time. In all the games, Zhu would grab a big lead, and then Liu would fight back. But overall, Liu was a little too passive in this match." Wu (born March 1982) beat Yan 3-2 (7, -6, 3, -6, 9) on June 29 in the Nanjing-Shaanxi tie. Coach's comments: "Wu has played very little up to now, but he was confident playing Yan. We felt that he and Yan are at the same level, so we played him. Wu received Yan's serves well, and was able to control Yan's first loop. Since Yan's first loop is his best weapon, if Wu could control that, he would have a chance. In addition, Wu strived to attack first when he served. Yan's defense is not as strong as his offense, and Wu used his pips-out loops to initiate the attacks. All 5 games were close, and Wu won because he played the critical points better." He Hailu (born April 1982) is a right-handed inverted fast-attack penholder, and he beat Liu 3-1 (9, 5, -9, 7) on July 17 in the Shanghai-Shaanxi tie. Coach's comments: "He Hailu was playing in the "A" league during phase 1. He is now playing in the Super League. He was able to beat Liu because (a) he has the fighting spirits with no mental baggage, and (b) he used his tactics successfully. He served right sidespins to Liu's short backhand, and because of the rotation of the ball, Liu was having trouble returning the serve short. That made it easy for He to start the attacks. Then He would serve deep to Liu's forehand to control Liu's attacks. This way he was able to create chances for attacks. Also, in the rallying phase he has the advantage. After the service rule change, Liu's serves were affected. On the other hand, He was not trying to serves too tightly; he jsut needed to serve reliably. He could let Liu open with a loop, and then play a rallying game. This tactic was successful." Chen beat Kong 3-2 (-9, -7, 7, 6, 8) on July 20. Coach's comments: "Chen beat Kong 3-2 in phase 1 primarily because Kong did not return serves well. Kong never felt comfortable in that match. This time both sides were better prepared, and Kong was returning serves better. Chen won because of his better first-3-ball skills. His serves allowed him to control Kong's attacks, as well as initiate his own attacks. Once in the rallying phase, Kong still has the advantage. There is luck involved in these two victories, but it also shows that Kong's service return game is relatively weak." Chen beat Kong in the Golden Ball match 5-4 on July 20. Coach's comments: "Chen was very lucky to win this match. He fell behind 1-4, but then Chen starting to win on all his serves. On serve returns, he basically placed everything short and not let Kong attack. Chen won 4 points in a row to win the tie. The key is that Chen has good serves, and that is a big advantage in a Golden Ball match." Ye beat Liu GZ 3-1 (8, 9, -6, 7) on July 20. Ye (born 82/1) is a right-handed pips-out penholder. Coach's comments: "Ye was playing very loose. Tactically he tried to initiate attacks early and control the table. In rallies, Ye was able to withstand the backhand exchanges and stay close to the table; that was a key point. When receiving serves, Ye would either loop or flip. He would serve mostly short and complement those with deep ones. His service placements were very lively, and executed the fast-attack pips-out techiques very well." Ye beat Ma 5-3 in the Golden Ball match on July 20. Coach's comments: "Ye was in great spirits after upsetting Liu Guozheng. Even against Ma, with the score 1-3, Ye was still playing relaxed. Ye basically initiated the attacks in the last few points. At 2-3, Ma made an error looping. At 3-3 Ye transitioned well from defense to attack, and looped beautifully. Even though Ye does not use the reverse backhand much, he was able to switch to the inverted side on his forehand to loop. The results have been quite good." Wang Yuegu (born 6/80) is a right-handed fast-attack shakehand looper. Coach's comments: "Even though she has not played Wang Nan in a long time, and that Wang Nan is a stronger player, Wang Yuegu felt confident because of the 11-point format and the new service rule. The key in this match was the variations of Wang Yuegu. She has many different serve return techniques: short placements, flips, backhand opens, etc. Those caused Wang Nan several unforced errors. Then Wang Yuegu has good serves, with very rich variations in spin and placements. Because Wang Nan is an oevrall stronger player, Wang Yuegu tried to avoid getting into rallies. Instead she tried to change the rhythm and power of her shots to confuse Wang Nan. Several times, Wang Nan appeared flustered after she could not finish points against Wang Yuegu. In the final game, the score was tight all the way, and Wang Nan appeared impatient and made errors." Tang beat Liu GZ 3-2 (-2, -6, 11, 9, 4) on July 24. Coach's comments: "In this match Tang played to his normal level. Tang played Liu very evenly in national team matches, so technically he is not at a disadvantage. Although he was down 0-2, Tang was still playing solidly, and came back to win. Liu did not return serves well and made unforced errors. In the rallying phase, Liu did not play better than Tang. Also, Tang beat Liu at the 9th National Games last year, and Liu felt the pressure. I think at the end, it was a mental game more than anything." Coach's comments: "Xu is young and feels no pressure playing Wang. 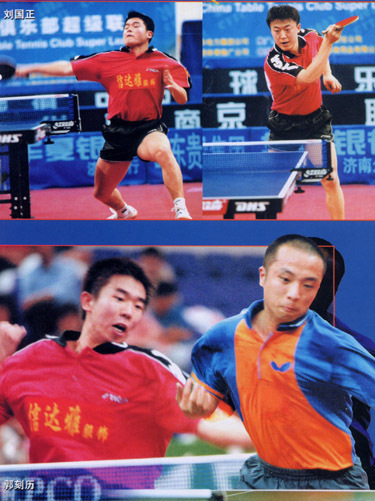 In 2000 Xu beat Wang in a Super League match, so Wang was the one feeling a little pressed. On the court, Xu was aggressive and taking initatives. Even though Xu does not hold an advantage during rallies, he tried his best to change his lines to place the ball to Wang's middle or backhand so as to avoid Wang's powerful forehand. Other than a few forehand-to-forehand looping rallies, Wang did not have a clear upper hand during extended rallies. In addition, Xu' specialty is serve return and short-ball control, and he was able to loop first. Guo (born 1/80) is a right-handed shakehand looper-fast attacker. He beat Persson 3-1 (-6, 7, 11, 8) on July 27. Coach's comments: "In the first game, Guo was not playing carefully, and he was not following the game plan we set up for him. He tried to force his 2rd-ball attacks and ended up making unforced errors. Starting from game 2, Guo changed his strategy, He stood close to the table, and counter-rally close-table with Persson. That allowed him to exploit his own forehand advantage, through placement and speed. That strategy was successful, and he had the edge in rallies. Persson had less speed, and he used his backhand topspin, counters and blocks more, but could not power the ball. Persson's shots lacked power, and gave Guo opportunities to attack them".